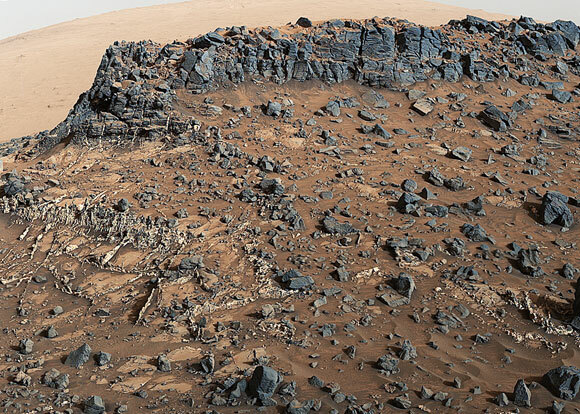 This new image from NASA’s Curiosity Rover shows the the “Garden City” site and surroundings on Mount Sharp. This view from the Mast Camera (Mastcam) on NASA’s Curiosity Mars rover shows a site with a network of prominent mineral veins below a cap rock ridge on lower Mount Sharp. Researchers used the rover in March 2015 to examine the structure and composition of the crisscrossing veins at the “Garden City” site in the center of this scene. For geologists, the vein complex offers a three-dimensional exposure of mineralized fractures in a geological setting called the Pahrump section of the Lower Murray Formation. Curiosity spent several months examining sites in the Pahrump section below this site, before arriving at Garden City. Mineral veins such as these form where fluids move through fractured rocks, depositing minerals in the fractures and affecting chemistry of the surrounding rock. In this case, the veins have been more resistant to erosion than the surrounding host rock. The component images of this mosaic view were taken by the left-eye camera of Mastcam on March 27, 2015, during the 938th Martian day, or sol, of Curiosity’s work on Mars. The scene is presented with a color adjustment that approximates white balancing, to resemble how the rocks would appear under daytime lighting conditions on Earth. For scale, the cap rock scarp is about 3 feet (1 meter) tall. Figure A includes scale bars of 1 meter (3.3 feet) vertically and 2 meters (6.7 feet) horizontally. 1 Comment on "New Curiosity Image Shows ‘Garden City’ Site on Mount Sharp"